A new express lane on 680 in Fremont is set to speed up Bay Area commutes while giving city officials the heads up on illegal driving. Scott Budman reports. 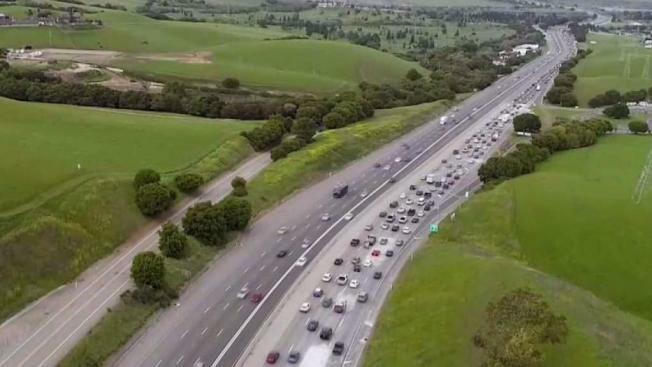 Officials on Thursday broke ground on a new express lane along one of the most congested corridors in the Bay Area: northbound Interstate 680 over the Sunol Grade. "Traffic is one of the key issues many people in the valley struggle with," said Fremont Mayor Lily Mei. The additional fourth lane will extend roughly nine miles from the Mission Boulevard and Auto Mall Parkway area of Fremont to just north of the Highway 84 exit for Livermore. One transportation official said the extra lane will result in "significant, substantial congestion relief" for the frequently clogged stretch of freeway. "The bottlenecks that everybody's seeing from 1 to 8 p.m. today are going to be totally eliminated," Arthur Dao with the Alameda County Transportation Commission said. "What we're trying to do is replicate the effect that we had with the southbound improvement that we did a few years ago." Instead of rolling along at speeds of 10 to 15 mph as they are right now, motorists will eventually be able to cruise along at 55 to 60 mph once the express lane becomes operational in the fall of 2020, Dao said. "If you're late, and you're a single occupancy vehicle, and you need to pick up your child from childcare and you want to get into the lane, you'll have that ability," said Scott Haggerty from the Alameda County Transportation Commission. When complete, the express lane will act just like the other ones scattered across the Bay Area. Carpoolers and any motorist with a clean air vehicle decal will able to use it free of charge. Solo drivers with a FasTrak tag will also be allowed to use the lane if they are willing to pay a toll. The toll will fluctuate based on timing and demand. "It's convenient," commuter Leo Serrano said. "If it gets me out of traffic, I don't mind paying." Commuter Robert Malik, on the other hand, is not so fond of the project. "I don't think we should have to pay for it," he said. "I think it should be something that just comes along with driving on the freeways. Seems like we already pay for our roads and what not." The project is estimated to cost around $205 million with most of that money coming from Measure B funds and construction is expected to last until late 2020.